The Institute of Environmental Management and Assessment (IEMA) has announced the appointment of Drs Daan Elffers, CEO of EMG Group, to its Strategic Advisory Council. With more than 15,000 members in over 100 countries, the IEMA is the world’s largest membership organisation for environment and sustainability professionals. The Strategic Advisory Council is the top-level consultative and advisory body of IEMA, representing the views of the membership at large and offering advice to the Board of Directors. The role of the Strategic Advisory Council is to predict the diverse effects of political, economic, social, technological, legislative and environmental conditions that might have a direct or indirect impact on the environment and sustainability profession. The Strategic Advisory Council is chaired by Professor Martin Bigg, Professor of Environmental Technology Innovation at the University of the West of England, Bristol. 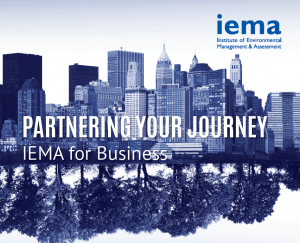 EMG has long been involved with the IEMA, most recently as a steering group member for the Resource Network campaign, aimed at making the circular economy more practical and accessible for business. Council member terms will be for a period of 3 years, with a maximum of total of 2 terms before having to step down.